Residents in Korea woke up to the coldest morning of autumn so far, as the mercury plunged to 2 to 12 degrees Celsius nationwide, about 2 to 5 C lower than Wednesday’s temperatures. Temperatures in the morning recorded 6 C in Seoul, minus 1 C in Daegwanryeong and minus 4.1 C in Seoraksan, Gangwon Province. 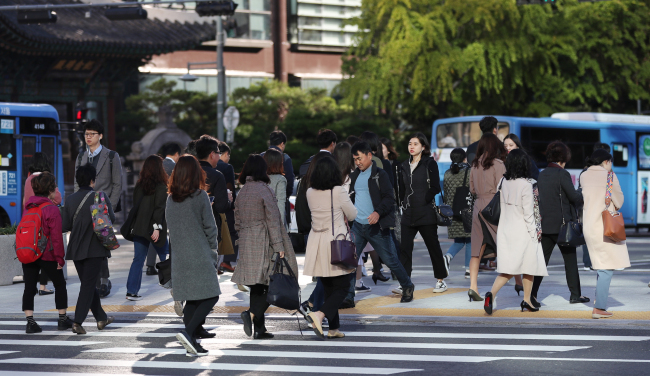 Daytime highs will hover at 14 to 19 C in the afternoon, but strong winds across the country will make the weather even chillier, the Korea Meteorological Administration said. Central parts of the country will see frost in the morning, while ice could be found in the mountain areas. Clear skies will be seen in most parts of Korea on Thursday, but light rain showers could fall on Jeju Island and west coast areas sporadically, the weather agency predicted. There will be no rain throughout the week, but chilly weather will grip the country until the weekend. Morning temperatures nationwide on Friday will be colder than Thursday’s, with lows of zero to 10 C.